Margaret Gonglewski came to GW to direct the German language program in 1995, after completing her PhD in German at Georgetown University. 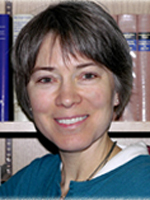 Her scholarly work focuses on foreign language pedagogy, and she is co-author of Treffpunkt Deutsch, one of the top introductory level German textbook programs in North America. She has published articles on topics such as effective uses of technology in language teaching and learning, critical issues in materials selection, and the paradigm shift from language labs to language centers. From 2004 to 2008, Gonglewski served as the first Director of the GW Language Center, initiating innovative programming, as well as support and recognition for GW’s language faculty. She has been awarded several grants for developing materials to assist faculty in teaching business languages, and she is currently Business Languages Coordinator for GW’s Center for Business Education and Research, funded by a grant for the U.S. Department of Education. She won a Bender Teaching Award in her third year at GW and in 2002 she received the CCAS Award for Excellence in Undergraduate Academic Advising. 2013. LaissezFair: A case for greening the business German curriculum (with Anna Helm), Unterrichtspraxis, 46 (2), 200-214. 2013. Treffpunkt Deutsch, 6th edition (with Beverly Moser & Cornelius Partsch). Upper Saddle River, NJ: Pearson Education. 2010. An Examination of Business Case Methodology: Pedagogical Synergies from Two Disciplines (with Anna Helm), Global Business Languages, 15 (1), 17-31. 2008. Thinking globally, acting locally: Selecting textbooks for college-level language programs (with John Angell & Stayc DuBravac), Foreign Language Annals, 41 (3), 562-573. 2007. Toward higher ground: Transforming language labs into language centers (with John Angell and Stayc DuBravac), IALLT Journal, 38 (1), 15-48. 2006. Multiliteracy: Second language literacy in the multimedia environment (with Stayc DuBravac). In L. Ducate & N. Arnold (Eds. ), Calling on CALL: From theory to research to new directions in foreign language teaching (pp. 43-68). San Marcos, Texas: CALICO.